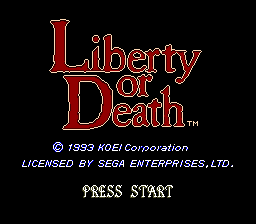 Liberty or Death is a simulation game released by Koei for the Sega Mega Drive. The Mega Drive version was exclusive to North America. It is set in the American war of independence. Main article: Liberty or Death/Magazine articles. NEC Retro has more information related to Dokuritsu Sensou.